Ever since Star Trek first hit our TV screens, back in 1966, Star Trek, the original series and all of its various spin-offs, sequels and prequels, set the pace for many other science fiction films and TV shows that followed. Out of all the aliens and Star Fleet personnel, one character stood above the rest, as the most enduring and much loved character of them all, Mr Spock, played by Leonard Nimoy. Spock and Star Trek have been around for most of my life and I was surprisingly touched when I read that Leonard Nimoy passed away, yesterday, 27th February 2015. It’s strange how a pointy eared Vulcan, who rarely showed any emotion, made such an impact and how phrases like ‘Live long and prosper’ became so well known. Stranger still to think, that Nimoy will not pop up again in a cameo role in some future incarnation of Star Trek, or even on The Big Bang Theory. I somehow think, though, that we will be seeing Mt Spock and the rest of the crew for many years to come; such is the enduring appeal of Star Trek and Mr Spock. 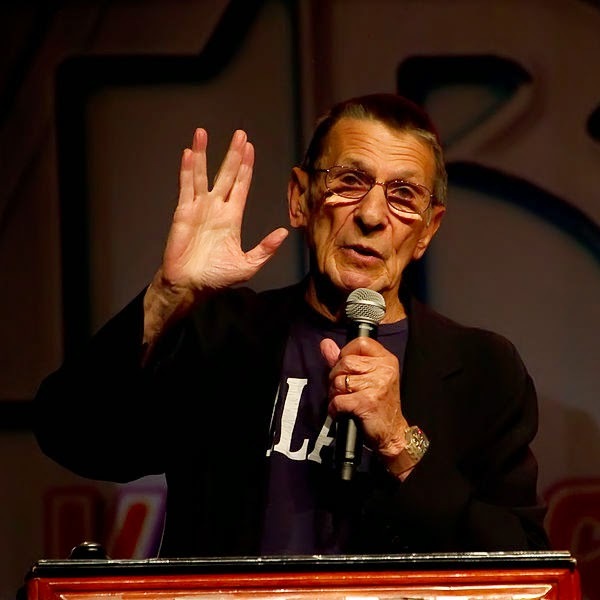 In tribute to the most logical and fascinating Mr Spock and, the man behind the character, Leonard Nimoy, Here are ten things that may you not have known about Star Trek’s Mr Spock, Leonard Nimoy. It’s hard now to see a photo of Léonard Nimoy and not think of Spock. The inevitable type casting that Nimoy endured, played on his mind a lot too. He sometimes discussed his own identity crises he had with the character, and he called his first autobiography “I am not Spock”. He later embraced the character and agreed to appear as Spock in ‘Star Trek into Darkness’ and called his second biography ‘I am Spock’. A change of heart all Star Trek fans will be grateful for. 2. Nimoy cried at the death scene of Spock in "The Wrath of Khan"
4. He also came up with the phrase "Live long and prosper". Nimoy’s favourite artist’s was Vincent Van Gogh with whom the actor said he could identify when he was first starting out in his acting career, because they both believed that they “had something to offer” and they wanted to give it. Star Trek fans will know that Leonard Nimoy directed the movies “Star Trek III: The Search for Spock” and “Star Trek IV: The Voyage Home”, but he also directed several other movies as well including the comedy “Three Men and a Baby”. Nimoy took up photography as a young boy and his pictures, mainly portraits of people, have been exhibited in many museums and galleries including the Museum of Fine Arts in Houston and the Sherman Gallery at Boston University. During filming of Star Trek, William Shatner would often play jokes on the po-faced Nimoy and one of his favourite jokes was stealing Nimoy’s bicycle to get the front of the queue at lunch breaks. Only the die-hard Star Trek fans would probably really appreciate Leonard Nimoy’s forays into the music business. After all, his first album was entitled “Leonard Nimoy Presents Mr. Spock’s Music from Outer Space”! When you watch Star Trek, the original series, today its special effects and scenery are nothing compared to the modern blockbuster movies. What does stand out though is the message of unity across races that the show gave; at a time when racial harmony was probably still a dirty phrase. The character of Spock personified this message. He was, forgive the phrase, a half breed, living in the wrong end of the galaxy, with the wrong people. It was Léonard Nimoy’s incredible performance that gave the character of Spock believability, pointy ears and all. How many men could have pulled that off? Go boldly, Léonard Nimoy, to where you have never been before, and now you really can live long and prosper.